Today Parker and Vegas came home from the track. For the last time. They are being retired. When I heard about it, I got Jen to drive me down so I could welcome them home. And so I could see my young boys… Monster and William… head out for their first trip to the track. Kind of a scruffy pic of Parker from last winter. Parker is 7 years old. He’s been a respectable racehorse. He always tried his little heart out. But just never quite got it all together. 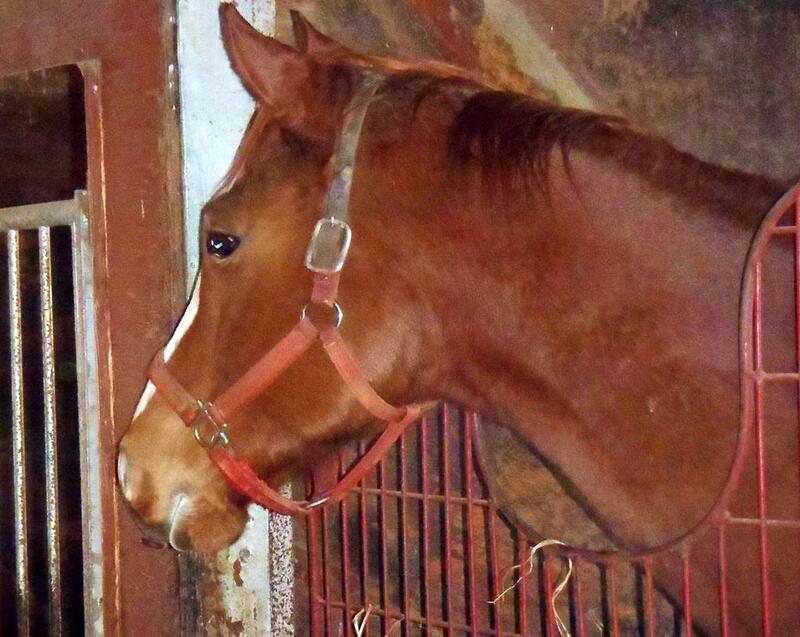 Luckily, he’s beautiful (a super flashy chestnut), personable, sound, and has an owner who loves him. So he’s going to have a good future one way or another. Vegas is his younger brother by a year. He always had a lot more natural talent than Parker. But a lot of bad luck. And he is a big bull of a horse, which always made him tough to rate. He is not so purely beautiful as Parker. He’s just way too big and imposing to be pretty (his nickname at the track was “the police horse”). But he’s just as friendly and cheerful. He has the same owner and thus the same safe fate. The boss came home with the two boys, along with Harri in the truck with the driver. They sedated Monster and William a little bit first. Monster, who is not exactly a bundle of energy on his best days, was quite sleepy looking until he saw the trailer. Then he told everyone that he wasn’t interested in that contraption. William said the same thing. Chaos ensued. Eventually, I couldn’t stand watching (okay there wasn’t much “eventually” about it LOL!) and got involved. We managed to get Monster on with a fair bit of pressure. Once loaded though, Monster discovered a big hay net. Yum!!! He cocked one hind foot and set about finishing that as quickly as possible. But William was not so easily convinced. He eventually kicked the driver right over backwards down a bank. I finally sent them all away. Made them go into the barn and told them not to come out. William, at two. Playing in the field. 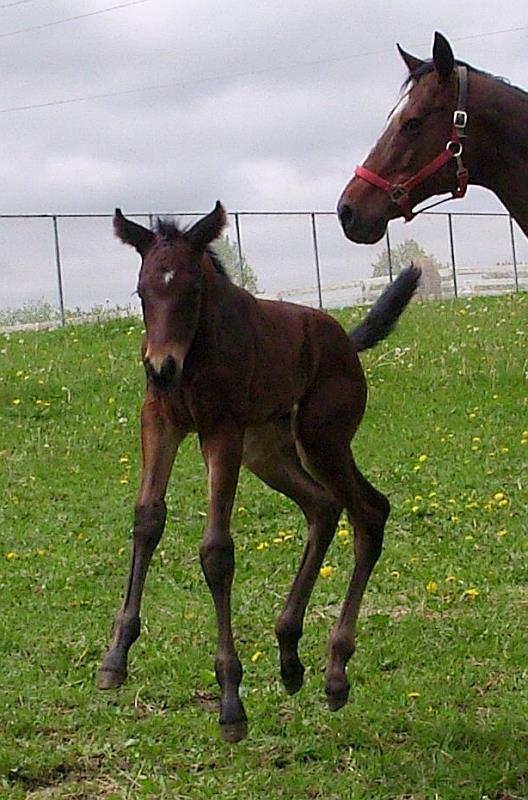 William was a funny foal. He really liked scratches. Not just the normal way that foals like scratches. William would go into a trance and start tipping over. And he never outgrew that. To this day, if William is jittering around, you can reach out and scratch him and he’s completely immobilized by his own bliss. So I essentially clicker trained him onto the trailer. First I took him away a few steps. Scratched him for a minute. Asked him to step forward. “Good boy! !” Many scratches. Asked for another step. “Good boy!” More scratches. He figured it out within a couple of minutes. He never once went backwards at all. We just did a step-scratch-step-scratch routine all the way onto the trailer. Jen timed it and said it took seven minutes from the time I shooed the men away until he was totally loaded on. Here’s Monster getting his scratches way back when he was little or at least littler. I don’t seem to have any of William from that time. It ought to be beneath me, but I could not resist telling the guys rather gleefully that it was pretty sad when a one-armed woman (me with my broken elbow in a full splint) could load a horse that three men couldn’t manage 😀 They took it well. And, since I seem to be in a very self-congratulatory mood today… I had another physio appointment this morning. My therapist was again amazed by how my elbow is doing. From last Thursday to Tuesday, it increased 20 degrees. From Tuesday to today, it opened another 20 degrees. So a total of 40 degrees of improvement in 8 days. She told that is phenomenal and that she has never seen that much improvement in such a short time. Now, mind you, we also determined that I’m getting a bit of soreness right where the fracture occurred. She thinks that it would be best if I didn’t have any more radical improvement for a while. So I told her I’d leave the splint on more for a couple of days to let it rest. I have an appointment on Tuesday morning with the surgeon to have it x-rayed and checked. So we’ll see what he thinks. But in general, the whole arm is feeling VASTLY better. My first physiotherapy appointment was last Thursday. I had pretty limited range of movement in the elbow, and even in my wrist, due to the length of time it had all been in the various casts. I was pretty disappointed initially in just how little movement I had, and also in the total lack of muscle strength. The therapist told me that elbow joints are pretty much the most difficult to rehabilitate due to the very high range of motion that an elbow normally has. It really is a pretty remarkable joint when you analyze it. You can rotate your lower arm right around and still open and close the elbow joint… at least you can when you don’t have an elbow full of inflammation. On the weekend, I went off to Chrystal’s place to celebrate Tracey’s first 50 mile ride. She and Summer finished the 50 at Oktoberfest in great shape. A veterinarian friend who was there offered to do some acupuncture to possibly help it heal a bit. While I kind of believe in acupuncture… I’m a skeptic really. But it was nice of her to offer and I figured it couldn’t hurt. It took about 20 minutes. And in another 10 minutes or so I realized that some of the inflammation was gone. I had also been taking Ibuprofen over the weekend so that may have contributed. Tracey (who is a nurse) pointed out to me that I really should be taking something regularly for the anti-inflammatory benefits, and also to keep the pain to a manageable level. Anyway, I caught a ride home on Sunday morning (I still am not allowed to drive), and resumed my exercises (which I am doing faithfully and then some). And discovered that I was really seeing some improvement finally. Yesterday when I went in, the therapist again measured my range of motion. “Wow!” she said. Then she looked at her chart again to double check. “That’s a 20 degree difference in four days! That’s amazing!” I was pretty happy with that. She told me to carry on with whatever I’m doing. She did warn me that I would not see that kind of improvement every week, so not to expect it. But still, I’m definitely on the mend. For those of you who don’t know Diego… he’s a returning placement. An older Arab. He got a bit out of control, and his rider was hurt. So he’s going to need some work on becoming a good citizen. I also have Spanish Lady back. 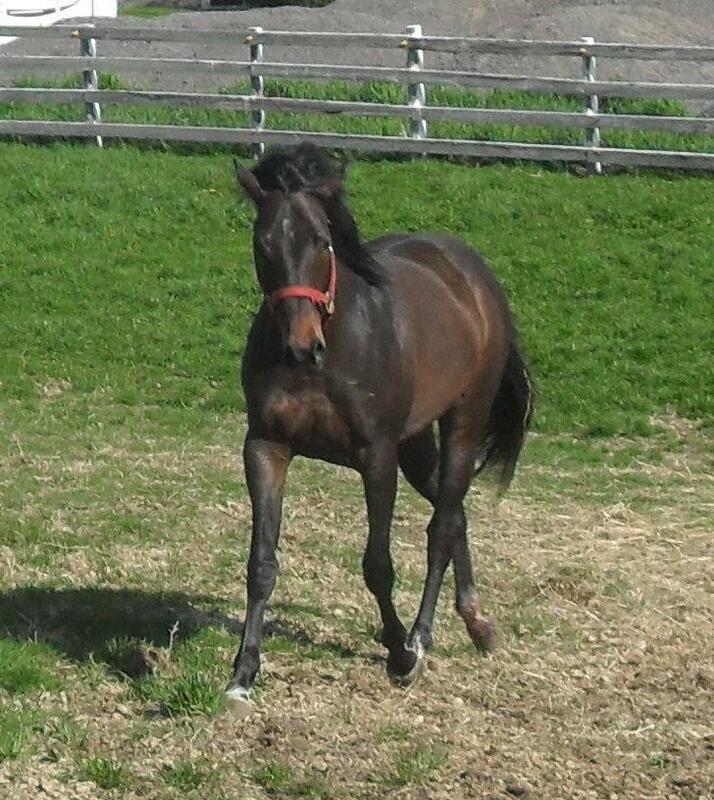 She’s a Standardbred that I placed last year. She’s not so much of a behaviour problem, more of a victim of human life circumstance. 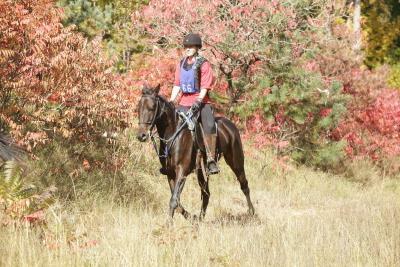 She has spent the entire summer being trail ridden by kids though, and is rather an unflappable little mare. Given that she’s only four, I suspect she is going to make someone a supremely reliable trail horse. This place is bursting at the seams. Yikes. With all the distraction of my new little mare, and my broken elbow, I never did post a report on Ana and Ares very successful 25 mile Set Speed ride at Oktoberfest. Ana worked hard all summer preparing Ares and herself to enter a 25 miler at the end of the season. It was a big undertaking, especially considering that Ana had only had a couple of months of riding lessons several years ago. So she was quite green herself. But what she really is… is dedicated, and that’s why she and Ares did so well. So when the big weekend came, I hitched a ride for Ares, Ana, and me with Chrystal in their big trailer (I’m not allowed to drive in a cast). Ares was a good boy, and loaded up within a couple of minutes despite the strange trailer and strange horses on that trailer. Once we got there, I checked around to see who exactly would be riding in the 25 the next day. I had planned to ride with them, but obviously that was out. 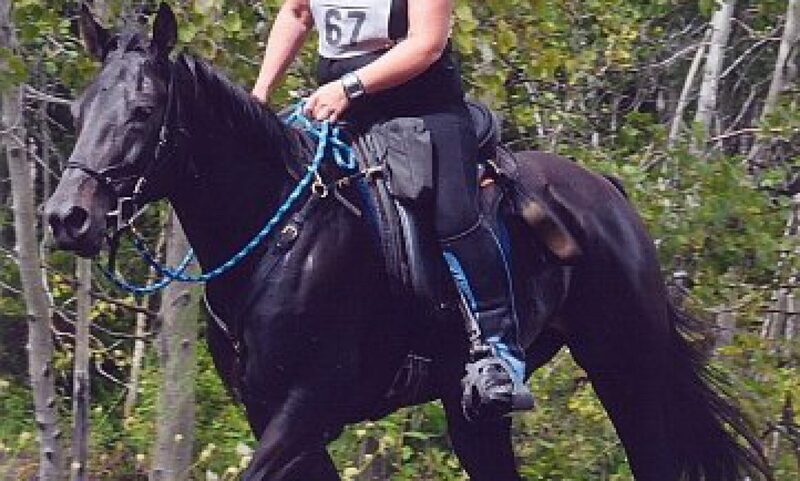 On the start list was Patricia and her terrific Morgan, Flash. He’s a tough old campaigner with well over 3000 miles in OCTRA competitions. Patricia is very experienced, and I was really pleased when she agreed to let Ana ride with her. 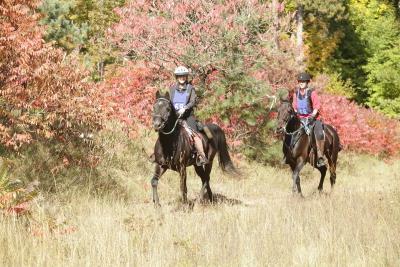 They went out for a short tour on Saturday to stretch the horses’ legs and all went well. Ana used my Australian saddle for this ride. We’ve been tinkering around trying to find the right saddle for Ares and have not quite hit on a solution yet. The treeless saddle was starting to give him some back soreness. And a small AP english saddle fit him pretty well, but was unbalancing Ana (looks like one of the panels is a bit crooked). Anyway, Ana had the tack all cleaned up, all her supplies ready, and Ares tail braided up with red electrical tape and red ribbons. Since he’s new at this, we were concerned that he might kick. On Sunday morning, Ana was pretty excited and nervous, and Ares looked a bit wide-eyed too. But I told Ana just to keep him moving around the camp and stay as close to Flash as she could. They had a couple of jittery moments, but Ana is very good with him, and handled it well. She told me later that he was really good on trail. He followed Flash quite happily. However, at one point, another horse crowded him from behind, and he did kick. And connected. Poor Ana was mortified when she told me about it. But I pointed out to her that if ever a horse had warning signs posted on his behind, it was Ares. Between the red tape and the red ribbons, it was a very clear message to other riders to stay clear. The horse that was kicked was fine. And was also a bit green, so had been crowding Ares. Which the other rider obviously knew because she was not angry about the kick. Going out on the second loop, Ares was again quite excited and wanted to move right out. So he definitely wasn’t tired yet. At the finish, his final heart rate was 48 (his resting seems to be 42-44). Unfortunately, he had rubs (not raw, but hair rubbed off) from the front edge of the saddle flaps on both sides, so there’s another saddle that won’t work on him 🙁 He ate and drank all day. And was very good about taking electrolytes. He had a little nap in the afternoon after he’d eaten some hay. And looked pretty pleased with himself thereafter. Ana would only admit to being just a LITTLE bit tired and sore. Though I did hear through the grapevine that she looked like a creaky arthritic old lady the next morning at work. Once the speeds were calculated, they had averaged 6.22 mph and a Grade III completion. I thought that was a very respectable finish for a girl and horse who both started the summer as green broke 🙂 And much credit is due Patricia too. Ana enjoyed riding with her a lot, and she and Flash were real steadying influences. Ana went home with a completion certificate and a nice big ribbon. Her first ever. She is very proud of it. She has big plans for more ribbons next year. Dressy got up to see me. And I discovered that she was in one of her snuggly moments. She looked sleepy and smug and pleased with the world in general. Venice was watching, so I spent a long time catering to Dressy’s mood. I scratched her chest, kissed her nose, let her rest her head on my shoulder, and told her lies about how I still loved her. Venice was shocked. And amazed. And wriggling with rampant curiosity. I was just on the other side of the fence, and she kept sneaking up behind me and reaching out to aaaalllllmost touch my back. She didn’t think I could see her out the corner of my eye. She could clearly see that Dressy was enjoying something purely wonderful. She didn’t understand it at all, but she sure did want to know what it was. Since then, she has shown some incremental improvement in her trust of humans too. Today when I sat down with her feed tub in my lap, she was enthusiastic enough that she touched my hand a couple of times with her upper lip as she was eating. Not on purpose, but she is no longer being excessively cautious about accidentally running into any part of me. And she moves towards me without all the suspicion when I come to sit with her. I am nowhere near to getting a halter on her. But with my broken elbow, I can’t even get a halter on a broke horse. So there’s no point in rushing things along. I went into the hospital this morning and they took off the cast and put a removeable splint on it instead. So I finally have a bit of freedom of movement. Kind of. Everything seems to have seized up. The elbow I expected, but my wrist isn’t moving either. It’s going to take some physio to get all that unlocked. But at least I can start doing some exercises anyway. And… my laptop died. So I am reduced to using my little netbook. With a teeny tiny keyboard. And a wrist that doesn’t bend. Venice seems to be getting a little braver. She’s been eating from a tub at my feet or in my lap for quite a while. But she is so cautious that she snatches a bite then backs up to chew before darting in for another bite. Today she seemed a little calmer about it, and didn’t really back up. Just stood and ate. The latest on my broken elbow is that I went in to get the half-cast off today. They put a full fiberglass cast on to replace it. The angle that they’ve put my hand at is a little better for typing this time. So I might actually be able to do a few things on the computer now. The surgeon was very pleased when he looked at today’s pictures. Said it was healing well. He also said I could stop taking the anti-inflammatories that were messing up my stomach so much.